Emmy and Golden Globe winner Michael Chiklis was born in Lowell, Massachusetts on August 30, 1963. The multilingual Chiklis is of Greek American heritage from his father’s side. As a child, he performed impersonations of celebrities in front of his family, developing his love of acting. Before pursuing professional acting, Chiklis studied Fine Arts at the Boston University College of Fine Arts. Michael Chiklis got his first film role in the movie Wired in 1989. When he was 20, he shaved his head for his role in You Can’t Take It With You and made a mistake by taking it off using greasepaint. This killed his hair follicles and became a traumatizing experience for him as an actor. 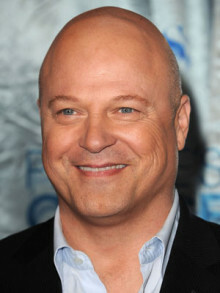 Chiklis became a guest star on numerous television series, like Miami Vice, L.A. Law, Murphy Brown and Seinfeld. He also had a small role in the film Nixon, but gained critical applause for his performance in The Commish. He next starred in the short-lived NBC sitcom Daddio. He then played Curly Howard in a television movie about the Three Stooges, and afterwards decided to reinvent his image. In 2002, Chiklis auditioned for the series The Shield and got the part of the tough detective Vic Mackey. He is the head of the Strike Team and is the show’s modern day Robin Hood. The Shield was controversial for its violence, but Chiklis was praised by critics for his performance. Since then, he has appeared in a variety of films because he was no longer typecast in his past image. In 2005, he landed the role of The Thing in Fantastic Four, and reprised it in the sequel, Fantastic Four: Rise of the Silver Surfer. Chiklis has also won an Emmy Award for Outstanding Lead Actor In a Drama Series and a Golden Globe for Best Performance by an Actor in a Television Series-Dram because of his performance on The Shield. In 2008, he was given the role of the United States Secretary of Defense on the film Eagle Eye. Two years later, he landed a part in the ABC series No Ordinary Family as the superhero patriarch of the Powells. Do you want to hire Michael Chiklis? Directly request a quote. In 48 hours we can send you the availability of Michael Chiklis If you would like to book Michael Chiklis, Entertainment Booking Agency is the right place. We will offer you the best price and contact the management or we directly contact Michael Chiklis. For corporate appearances or speaking engagements you can contact our agents and the will help you true the process. Tags: hire Michael Chiklis, Michael Chiklis booking, book Michael Chiklis, Michael Chiklis appearances, find more information on booking Michael Chiklis for appearances, Michael Chiklis speaking engagements, Michael Chiklis endorsements/spokesperson, Michael Chiklis appearance fees, Michael Chiklis booking agency contact info, biography of Michael Chiklis, Contact an artist booking talent agent find a speakers bureau that can book Michael Chiklis, speaker booking agency for Michael Chiklis, Michael Chiklis booking agency, Michael Chiklis booking for corporate event. EBA is one of the biggest entertainment booking agencies in the World. We book hundreds of celebrities, artist, athletes and speakers in a year. Important to know is that we are not claiming to be the management of Michael Chiklis. We are not the official agent for Michael Chiklis. Companies from around the globe book these artists and speakers true our company be course we have one of the biggest networks and we always have direct contact with the artist or the management. We help you to find the right celebrities for your corporate of private events. Please contact one of our agents to get free advice and we will help to get the world-famous artist on your party.